Houses turned into rubble, a mother lamenting her son’s death and town residents who have just lost their friends and are losing hope after a recent shelling by the Ukrainian army – this is what RT saw when visiting Gorlovka. 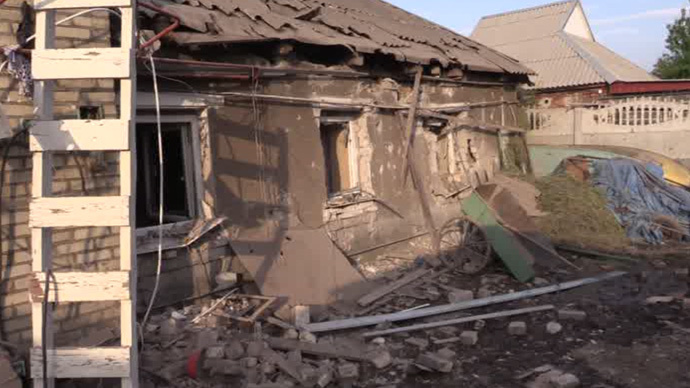 On Tuesday, a shell hit a residential area in the town of Gorlovka in the Donetsk region of eastern Ukraine. The town has seen heavy shelling since the start of Kiev’s military operation in the region. Three civilians, including an 11-year old girl, her father and another civilian, were killed in the incident, senior rebel forces commander Eduard Basurin said. Basurin blamed the shelling on the Ukrainian army. On Tuesday night, an RT crew and Roman Kosarev arrived at the site of the shelling, where they met distraught town residents. Another man told RT that he knew one of the victims, Yura, who was his school friend. “I say, ‘That's Yura, we went to school together’. So I rush to him. I bend over him and see blood is coming out of his mouth. And then I took a closer look and I saw that his legs are gone,” the man says. Four more people have been injured, including one serviceman, according to Basurin. The Donetsk People’s Republic has informed the OSCE mission of the incident. "If the artillery were removed 50 kilometers as agreed, it could not have reached the town," Basurin told Rossiya24 channel. The shelling comes amid a fragile truce between Kiev and the Donbass self-defense forces, which was agreed in Minsk in February. Despite the ceasefire brokered by the leaders of Ukraine, Russia, France and Germany, violence in the region continues. The Ukrainian army also files regular reports on casualties in the area. On Wednesday, one serviceman was killed and eight other injured while fighting self-defense forces in eastern Ukraine, a Kiev military spokesman said. Over 6,000 people have been killed and more than 15,000 wounded in eastern Ukraine since the start of the Kiev military crackdown in the region in April 2014, recent estimates by the UN human rights office say. Earlier this month, the Ukrainian parliament approved a law to remove the obligation to protect certain human rights in the Donetsk and Lugansk regions. Kiev says "anti-terrorist operations" in the area override their obligations in this regard.